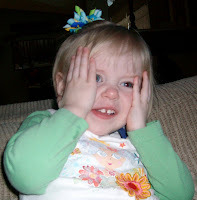 The other day Ciara was playing in the living room and all of a sudden started doing her "scared" thing. 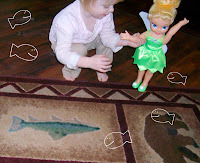 She wouldn't step on the rug where the fish is because she said it was HOT! She wouldn't touch it and was doing her little fakey cry because it was hot. So she went and got her Tinkerbell doll and made Tink touch the fish and then hugged her and said "hot fish!" It was really quite funny. She is okay with the fish on the rug now, but last night she and Randy were looking at a fish book and she pointed at one of the fish and said it was hot. I'm really not sure where this all came from. We haven't eaten any fish and we don't even own any live fish! After I tried taking a picture of the whole fish thing, she decided to actually pose for pictures of her and Tink!!! Saturday the young men and young women went and did baptisms for the dead at the Provo Temple. We had a really great time!!! The baptism area was very busy so they only got to do 2 names each, but still enjoyed it a lot. Afterwards we went and got a bite to eat. It was fun getting to spend some time with them outside of church. Last Friday I registered over at the MATC in Spanish Fork for their Nail Tech class. Figured I better do something since after the 10th of February I won't be able to legally sell my hair bows anymore! (CPSIA) : ( This is actually a good thing though and I am very excited because I have wanted to do nails for quite awhile and once I finish it allows for flexible scheduling compared to working in an office. So let me know if you want to be my guinea pig ... oh I mean let me practice on you!!! 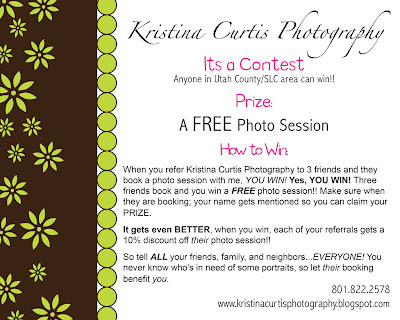 On a final note .... my friend Kristina (she did our family pictures), is running a special promo and contest so get over to her website and book an appointment if you want some fantastic pictures done! I love looking at our pics that she did for us and I get many compliments on them! And it's not just the great looking people in them. They are just great photos and we will be using her from now on for all of our pics! This past weekend I got to go out to Colorado and spend some time with my sis and her family! A couple weeks ago Rich had called me and asked if he could fly me out for a surprise for her as an anniversary present and send us to a show. He got us tickets to "The Color Purple". When he first told me that was what we were going to see I was so nervous cause I kept thinking that it was Purple Rain, which I've never seen but heard it was pretty naughty. LOL It wasn't until a few days before I left that I realized they weren't the same. I flew out on Friday and we went to the show that night. I had never heard of it (obviously), so I really did not know what to expect....it was a good show, not the greatest show, but was good. There were definitely some really funny parts. Sophia was hilarious and my kinda gal! Most of the show was surprising and sometimes shocking, but we had a good time. Saturday morning Kaden had a basketball game we went to. That was fun and really intense! I've been to NBA games before and they've never seemed quite that intense. We did some shopping and went to "Bride Wars" .... so cute and funny! Since I was out there we had to do some Guitar Hero competitions and I even managed to beat Kris one time!!! Wahoooooo! I love spending time with my lil' sister and I am grateful that we have such a great relationship. Thanks a bunch Rich for bringing me out there, even though it was a gift for Kris it felt like one for me too! 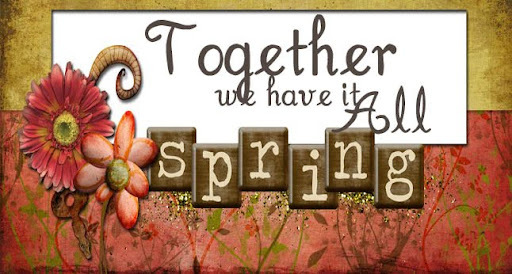 I am glad that I have a great hubby that let me go too and that he was happy to be home taking care of the kiddos! I finally got some pics of Ciara's ears! As usual she wasn't super cooperative, but she is just too cute! She still likes them and likes to get them "sparky" clean!!! I had to throw in the one of her trying to hide from the camera. This is her new "don't look at me", or "I'm scared" face. And on a final fun note ... both Ky and Dal drew out for the Turkey hunt this spring. They are both excited, especially Dallin! He even did some happy dance thing that was quite funny! We had a fun weekend and of all things, I forgot my camera both times I needed it! So that means I will post our fun without the pictures because I am apparently not tech savvy enough to get the pics I did take off of my phone. Last Thursday Randy and I took Ciara to get her ears pierced! I knew it wouldn't be great fun for her but figured we could get it done while she is young enough to not want to play with them. So far that part of my plan is working well. 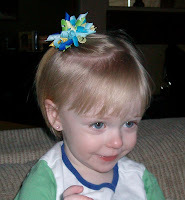 I asked her that morning if she wanted to wear earrings and she said "yes!" and took off to my bedroom thinking she was going to wear some of mine. It was really cute. We took her over to the Provo Towne Center to get them done and I don't know if the guns they were using were not so great or what, but it took longer then I've ever seen it take. The girl looked like she was really having to squeeze it so hard to get the earring through and of course Ciara was quite upset! 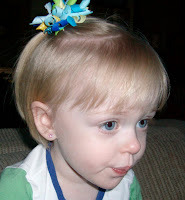 She does like her earrings now, and likes to have them cleaned or to have them sparky (sparkly). Soooo stinking cute!!! Thursday night we surprised the kids and told them they weren't going to school on Friday because we were going to St. George for the weekend. They were excited and so were we .... if nothing else we were getting out of town!!! The weather was sunny and in the mid to upper 40's so it wasn't warm, but it wasn't snowy either!!! We went up to Snow Canyon and did some hiking around and it was great getting to see the beautiful scenery. Ciara really enjoyed the hike too. Sometimes she wanted to walk, jump, or just be carried on daddy's shoulders. She really liked the little squirrels running around too. I think Ky and Dal enjoyed it more than being at school too! We thought it was too cold to be swimming outdoors so we took the kids to an indoor pool out there. There was a large water slide there that actually went pretty quick and Ciara loved it. She would laugh the whole way down. It was a great weekend that we finished by going to Delta to see Randy's family on Sunday, and stopped by the cemetery in Deseret. I just want to tell Randy a big "THANKS" for thinking that we needed to get outta town and taking us out for a fun weekend! If anybody knows how to get pics off my phone (motorola krazr) please tell me!!!! I am not a huge fan of snow . . . especially if I have to drive in it. Every once in awhile when it snows (and I don't have to drive in it) it can be really pretty to look at it. 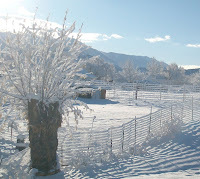 Our most recent snow storm brought the pretty kind of snow! 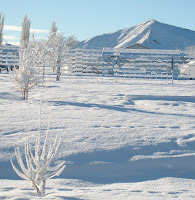 We went to bed Friday night and it was raining and woke up Saturday to a new blanket of pretty, white snow!!! 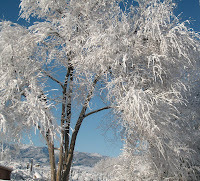 We got about 5-6 inches of new snow, so I thought I would share some pics of it with all of you.